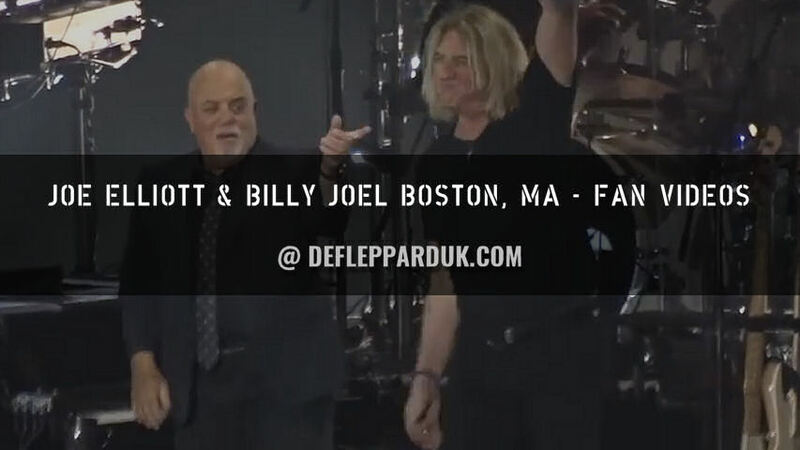 Def Leppard singer Joe Elliott performed with Billy Joel in Boston, MA last night and photos/videos are available. The show took place at Fenway Park in front of over 30,000 fans. The same venue Def Leppard will perform in later tonight as they start the third leg of their North American tour with Journey and support act Cheap Trick. Joe sang lead vocals on 'Pour Some Sugar On Me' and also appeared during the encore singing backing vocals and co-lead vocals on Billy's 1980 hit 'You May Be Right'. Joe sang lead during the song itself and the snippet of Led Zeppelin's 'Rock And Roll'. Billy has had other rock frontmen perform their own songs with his band in recent years including both Brian Johnson and Axl Rose playing AC/DC and Guns N' Roses songs during his ongoing residency at Madison Square Garden. Joe had attended Billy's concert at the AVIVA Stadium in Dublin, Ireland on 23rd June and mentioned he would be attending this show. 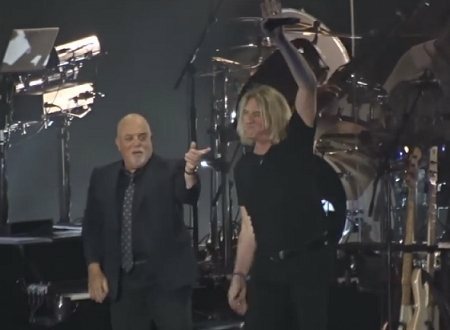 As you can see from the setlist Billy did not perform the song Joe had requested. Read his quotes from The Joe Elliott Show below. View footage of both songs via the YouTube playlist link and fan photos/video clips. Update - Playlist now features many different videos of 'PSSOM' and also all of 'You May Be Right'. Plus links to media reviews also featuring photos. Joe performed 'PSSOM' in the main set and on one of Billy's own songs during the encore. "Well during this mini break it would be forgiveable for anybody to think that all I did was sit around with my feet up on the coffee table watching the World Cup. That was about 99 percent of it for sure, but I did manage to sneak off and see a couple of gigs. Chalk and cheese but both fantastic. Starting off here with Mr. Billy Joel." "And before that Billy Joel who played the AVIVA Stadium which is where the Irish football team play most of their International games. From the album Glass Houses in 1980 we heard the song. Which he wouldn't play on the night. I had a beef with him about that. He As and Bs it with another one and swaps it out, but he has promised me he'll play it in Boston 'cause he's playing in Boston the night before we are. The song All For Leyna."